Picture a quiet river ambling across a treat of a city, with a rich historical background. Architectural wonders are galore, and needless to say, the city is bathed in beauty. The perfumeries scent the air while the bakeries lure you to grab a bite or two. It’s as though there’s no dearth of happiness, joy and of course, love. This picture goes with no other city but the City of Love – Paris. The city invites you to bask in its artistry, hence with no further ado, let’s embark on a journey to delight in its class and elegance. We take a look at the 10 things you absolutely must do when visiting the French capital. Bienvenue à Paris! 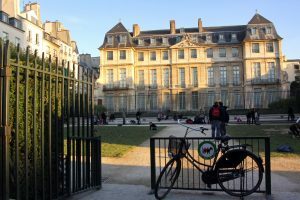 Paris is home to some of the cleanest and most charming gardens, and the Luxembourg Gardens – or the Jardin de Luxembourg as the French say – tops this list. 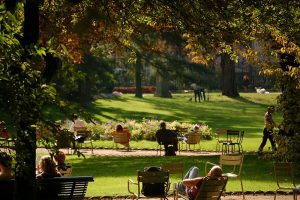 These gardens, bordered by Saint-Germain-des-Prés and the Latin Quarter, are ideal picnic spots for Parisians to bask in the sunshine, and let time take a break. The gardens also attract the sporty and athletic individuals of Paris, who come here on a daily basis for their jogging. Nevertheless, Luxembourg Gardens is the place to be if you want to take a leisurely stroll. Don’t forget to pop into the renowned Musée de Luxembourg for a quick round of the well kept art exhibits. Although it took a whopping €52 million and five years to complete it’s makeover, the Musée Picasso has gained tremendous popularity in Paris ever since its opening in 2014. This museum houses the world’s largest public collection of Picasso’s unmatched work. Two buildings cover almost 54,000 square feet, with a brand new structure along with the regal Hôtel Salé built in the 17th century, which are home to Picasso’s chefs-d’oeuvres. Take all the time you need to breathe in the Spanish master’s work in this museum. Nothing matches seeing Paris from a cruise on the river Seine. 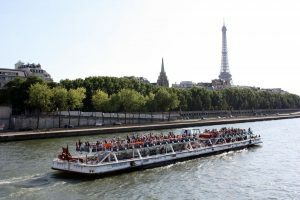 The Bateau Mouche cruises are operational from 10 am in the morning to 9:30 pm in the evening, and you can hop onto a boat from any of eight stops along the river, for an affordable 15€. The cruises offer a variety of facilities, ranging from dining, a glass of champagne, or simply sightseeing with commentary. The highlight of this cruise is undoubtedly the opportunity to see some of Paris’ most ornate bridges up close. Don’t miss out on a spectacular view of the Notre-Dame cathedral, and also the Eiffel Tower overlooking the city. 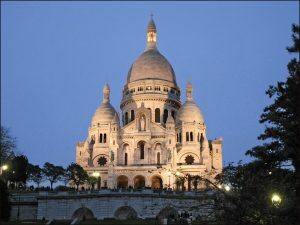 Perched upon the hill of Montmartre, the Sacred Heart Basilica bestows peace and serenity over the city of Paris. This white castle kissing the skies offers a splendid view of the entire city. The church was commissioned by the French Government way back in 1873 to symbolize the end of an era of conflict, which witnessed the Franco-Prussian War. Paul Abadie, the architect of this exquisite church, didn’t disappoint, taking the liberty to mix both Romanesque as well as Byzantine styles of architecture. When construction was completed as the First World War came to a close, the Church was consecrated in 1919. You will certainly experience what it is like to climb towards heaven when making your way towards the Basilica. 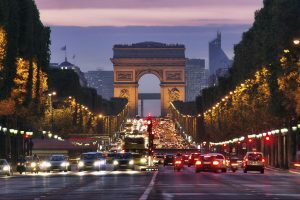 Over the years that Paris has grown, this avenue has always retained its number one spot of being the most famous avenue in the city, and perhaps even the world. Nobody fails to recognize it’s iconic curve upwards, leading up to the grand Arc the Triomphe standing triumphantly, lined with the neatly pruned trees. With innumerable appearances in films, this avenue needs no further introduction. The Champs-Élysées offers something for all tourists who flock here in numbers. The avenue connects Napoleon’s staggering monument to the Grand Palais which hosts some of the city’s most dazzling exhibitions of art. 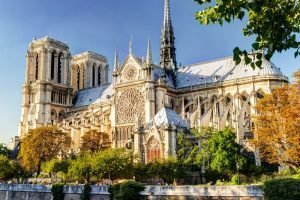 Parisians would like to consider the Cathédrale de Notre-Dame as the symbolic heart of the city, and maybe of France as well. Seated on the Ile de la Cité, the little island surrounded by the Seine, this cathedral has witnessed many a famous event in its lifetime. Napoleon himself was crowned here, and several kings and queens exchanged their vows in holy matrimony. Started in mid 12th century, this cathedral was built over close to 200 years, but unfortunately suffered severe damages during the French Revolution. After its restoration in the 19th century, it has not failed to make an impression on tourists and Parisians alike. Its Gothic architecture entails that this cathedral has few matches when it comes to beauty and elegance – the square facade speaks volumes of its architectural harmony. 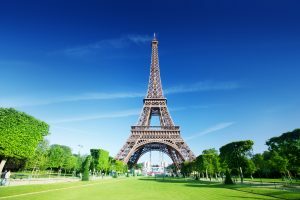 No visit is complete without satisfying the taste buds or stuffing your bags with a whole bunch of new clothes and gifts, and Paris will certainly not disappoint in these departments. 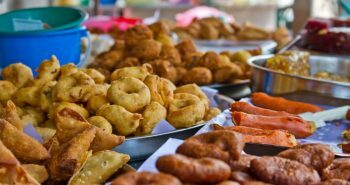 Food streets come alive right from the morning and offer a whole host of delicacies from across the globe. Try the crepes from France, the falafels from Israel and wash it down with a glass of café viennoise from Austria, which is a hot chocolate topped with whipped cream and dusted with cacao powder. 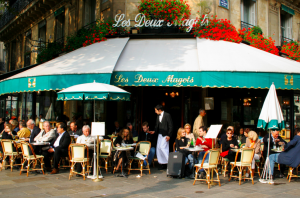 The bistros along the streets invite you to relax with your friends over a cup of coffee. 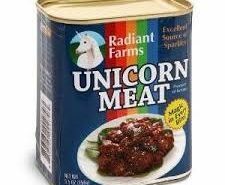 You certainly can’t help but stopping at every little restaurant and salivating! Furthermore, in one of the largest shopping capitals in the world, you can literally shop ’til you drop in the beautiful streets. All you’ve got to do is put down everything you ever craved for onto a dream shopping list and set out. With a wide variety of luxury items as well as cheap, ‘bon marché’ stuff, and the innumerable streets lined with shops, you’re sure to put a check mark beside every item on that shopping list of yours. 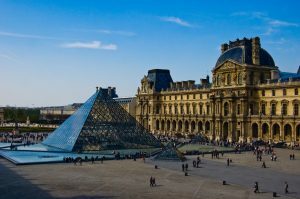 The most coveted of all museums, you must top off your séjour to Paris with a visit to The Louvre. It not only is the world’s largest museum, but also the greatest. Spread over a massive 675,000 square feet, this museum houses collections from practically every civilization that dawned upon earth. The most sought after pieces in the museum are of course the Mona Lisa, the Venus de Milo, and Winged Victory. Nevertheless, don’t hesitate to visit sections that interest you the most, since covering The Louvre in its entirety will literally take you over a month, if you want to do justice to all the magnificent work it has in store for you. Getting lost is a common story in this maze of a museum, but don’t worry as there will always be masterpieces which will keep you company. 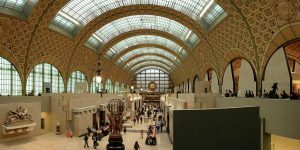 Formerly a grand Beaux-Arts railway station, the recently renovated Musée d’Orsay houses some of the finest impressionist works that you will ever get to witness. Impeccable paintings by the likes of Cézanne, Monet, Manet, Van Gogh, Degas, Gaugin, and many others are the real treat in this unique museum. The Musée d’Orsay also flaunts two exquisite cafés as well as a highly ornate restaurant on the first floor, which serves authentic French palatable cuisine. There’s also a nice bookstore which means you can pack your bags with gifts when you head back home. Inevitably we come to the icon of this beautiful city, the monument that has defined Paris for around 130 years now; yes it’s none other than the Eiffel Tower. Built on the occasion of the Exposition Universelle to commemorate 100 years of the French Revolution, Gustave Eiffel and his team got together to erect this fantastic monument made of wrought iron. It stands at 324 meters and is the tallest structure in Paris. The Eiffel Tower is home to two restaurants, and also a bar. Tourists can make their way to the top of the tower to witness one of the most spectacular views of Paris, or any city for that matter. One can see the Seine snaking through the city, watch the Arc de Triomphe with all the avenues converging towards it, and also see a speck of white on the Montmartre hilltop, which is indeed the Sacred Heart Basilica. What would be even more swell is if you can catch this monument at night in the magical Illumination Tours that Paris offers, where you can discover Paris’ monuments and bridges lit up to create a fantastical atmosphere, atop a double-decker bus, or even a cruise, which includes the Eiffel Tower as one of the many stops. 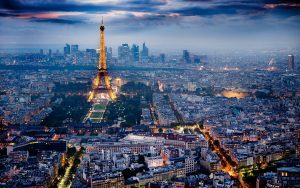 The image of this bewitching city from atop the emblematic Eiffel Tower is one that will certainly be archived in an exclusive corner of your memory. Paris certainly doesn’t end here. Some 20 kms southwest of the French capital is the glorious Palace of Versailles, which boasts of its 2143 windows, 67 staircases, and its one-of-a-kind geometrically patterned gardens. You certainly don’t want to miss out on savoring a fine example of 18th century French architecture and art. To be honest, the must-see Parisian landmarks are manifold and selecting 10 of the best is a hard task. Such is the case because every nook and corner of the French capital is practically a treat to the eyes, hence don’t hesitate to explore this city and find many more wonders you think your friends must absolutely visit in the City of Love. A bientôt!